Has Putin’s Misjudgement Created a Monster? In a claustrophobic courtroom in the city of Kirov, ironically named after a popular and prominent Bolshevik who fell victim to a jealous Stalin in 1934, a controversial but not entirely unexpected sentence was passed down upon Alexei Navalny, an equally popular and prominent political activist who appears to have fallen victim to a jealous Putin in 2013. The name of this tall, articulate activist has been on everyone’s lips of late, having gained widespread attention for his determined questioning of big business and his canny use of social media. His prosecution has catapulted him onto an even greater stage whilst subsequent reports have placed him on the pedestal reserved for great men of history. But as is so often the case, the frenzy of people clamouring to denounce the system neglect vital details and considerations in their desperation to indoctrinate the masses. We have a bad habit of trying to simplistically divide the world into black and white issues, excluding shades of grey. After 9/11 George Bush instructed the Earth’s population that they needed to decide if they were “with us or with the terrorists”. Throughout the seemingly never-ending ‘Arab Spring’ we impulsively assume that rebels are democrats by virtue of them opposing a government that happens to be non-democratic. And in Russia, we talk of those who oppose Putin as anti-corruption campaigners or fighters for justice, without consideration for how corrupt or unjust those same people may also be. 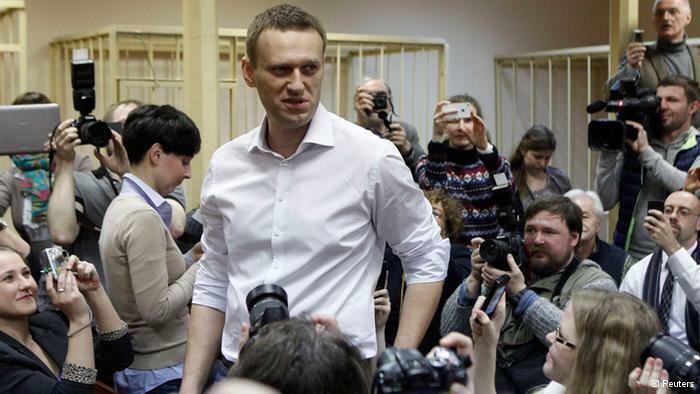 The verdict sentencing Alexei Navalny to five years imprisonment was unquestionably ludicrous, the evidence upon which it was based almost certainly fabricated, and the decision without doubt politically motivated. But this doesn’t make the accused a virtuous knight in shining armour, in the way he is being portrayed currently. 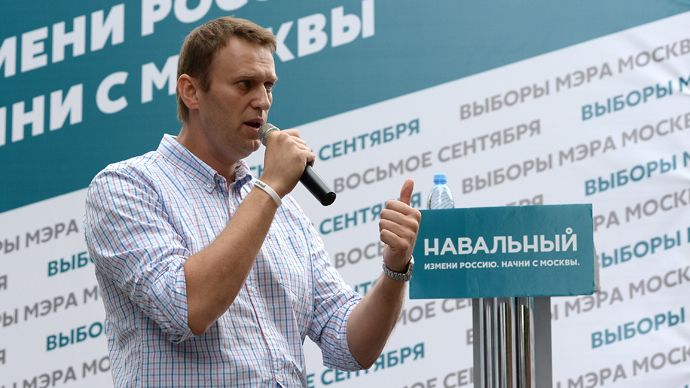 One might debate whether a leopard can change its spots but Navalny was stalking in the wild Russian political tundra long before he became obsessed with the fight against corruption for which he has won many admirers. 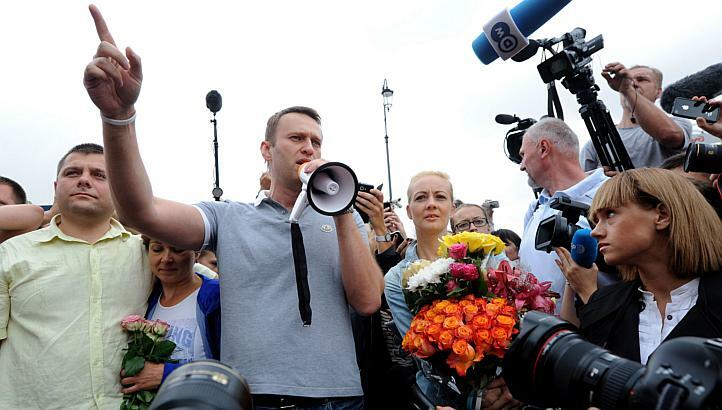 Navalny may believe in protest now, but in 2007 when a group of hecklers protested during a meeting he was speaking at, he offered them outside and shot one of them with a ‘traumatic pistol’. He later defended his actions by arguing that he fired the shot from a reasonable distance and didn’t aim for the demonstrator’s head. He also had a dalliance with the extreme right, creating a group called ‘Narod’ resembling the concept of the German ‘Volk’ and over several years spoke at and took part in the Far-Right’s annual Russian March alongside skin heads, ultra-nationalists and holocaust deniers. In quasi-political videos he warned of the Islamification of Russia, portraying those from the Caucasus as flies and roaches that need swatting and comparing illegal immigrants to bloodied teeth that required painfully brutal extraction. Even his fellow activist Maria Gaidar referred to his actions as ‘fascism’. One Human Rights leader banned Navalny from attending conferences, whilst his antics got him expelled from the liberal party Yabloko, one of the few serious legitimate organisations that might have stood a chance of challenging the status quo if they could have harnessed him. But just like many turbulently charismatic politicians throughout history, all others were mistaken in thinking they could control and use his skills for their own ends. Putin may well also find this to his cost. As usual our own media only tells readers half the story. Referring to him simply as an “anti-corruption blogger” the BBC’s profile of his ‘rise to prominence’ begins in 2008, conveniently omitting his suspect previous activities, whilst The Telegraph begins its account in 2011 when he is already heading up mass protest movements. Some publications have even referred to his imprisonment as “Russia’s Mandela Moment” which does a huge disservice to the former South African President. In his excellent latest book, journalist Ben Judah describes Navalny as a “rabble-rouser” and a showman with a quick temper. He astutely compares Navalny to Putin himself, pointing out how over time the oppositionist has picked up and run with several of the President’s core themes such as the ‘liquidation’ of oligarchs and heavy-handed policies in the Caucasus. Putin’s clamp down on adversaries has also led to a political vacuum which such a man can fill by replicating the popular side of early Putin and adding a double dose of handsome charm. 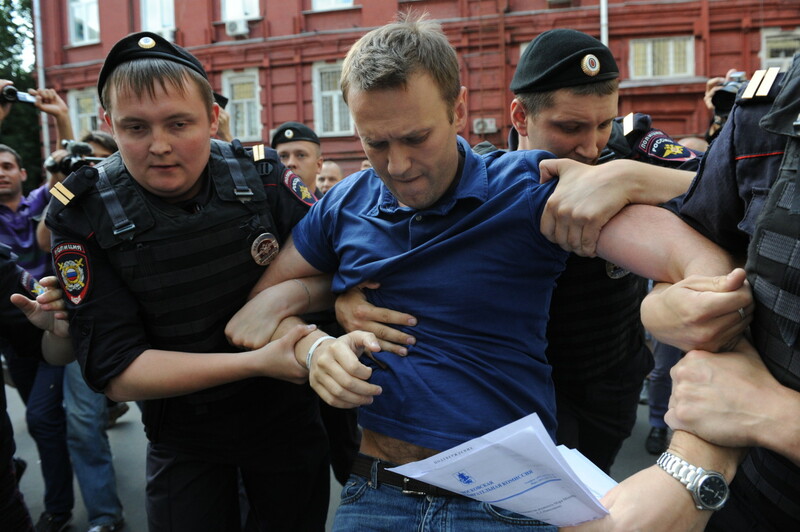 In many ways Navalny has out-Putined Putin. Indeed Navalny is nothing if not an opportunist. He has an enduring lust for power and prominence which has seen him turn his sails whenever the wind changed over the last decade. 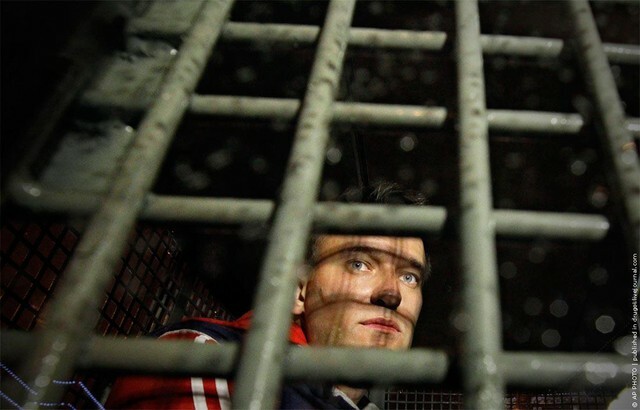 Those wondering why he looked so unmoved, even smug, when listening to his sentence should look no further than the resulting crowds on the streets chanting his name and the endless use of the #Navalny hash-tag on the social media site he is so addicted to. He knows that with the perceived dark figure of Lord Vader-Putin striking him down, he becomes more powerful than the President could ever imagine. As with much else in recent years, it appears that Navalny has shrewdly recognised the prevailing mood and ridden with it whilst Putin’s government has made what could turn out to be a colossal misjudgement. Of the President’s own creation, the recent political climate has woven together disparate organic pieces into an increasingly united body and with his verdict, the prosecutor delivered the lightning bolt capable of animating a monster. Even if an objective observer was not morally or ethically opposed to the judgement he should be pragmatically opposed simply on the grounds that it foolishly gives momentum to the very problem it is intended to prevent. Aside from adding one of the most astute, charismatic and dangerous politicians in the country to the growing list of symbolic martyrs that help to incite an already disenchanted and active segment of society, it increases the dismay that many Western observers feel when they look upon Russia from afar. I have said before that Russia is like a teenage son, you may love it for a variety of reasons, but its foolish and reckless behaviour often disappoints you. Russophiles throughout the World, myself included, tear their hair out when confronted with such a turn of events. Within hours of the verdict, the Russian stock market dropped by several percent, losing around £200m from its exchange, with companies like VTB and Sberbank losing up to 2.5% off the value. For a country looking to promote its economic importance as a way of excusing its other problems, this is unforgiveable. Mikhail Prokhorov quite rightly questioned why young businesspeople and professionals such as lawyers would want to remain in a country where their endeavours are put at risk. Russia needs external skills and investment, whilst it also seeks to partner with Western businesses. But those potential providers, investors and partners are understandably nervous about involving themselves with Russia in such circumstances. Money and morality are rarely comfortable bedfellows and whilst the occasional ‘activist’ is thrown in jail it is easy for ruthless businessmen to look the other way, but they are much less likely to do so when each slamming of the prison door also has an economic impact. If Russia wants businesses to risk their capital within its borders rather than in other emerging markets, it needs to provide stability and reliability not petulance and vindictiveness. Whichever stance you approach this judgement from, it is difficult to contemplate the nonsensical decision making or to project a result anything other than a victory for Putin’s critics. Mark Twain once said that “martyrdom covers a multitude of sins” and it is evident that with this verdict the Kremlin has assisted Navalny in his rebirth from sinner to saint. There are many who want Putin overthrown, but those talking of Navalny as a messianic alternative should be careful what they wish for. So last week our Chancellor of the Exchequer, George Osborne, made the apparently fatal triple mistake of working late, eating junk food, and failing to keep it a secret. Our spin-doctors and spooks were seemingly incapable of keeping such a heinous crime from the front pages of national newspapers who flame-grilled Osborne about his ‘sham-burger’. As I sat reading the newspapers the next day several questions sprang to mind. My first inevitably was a flippant ‘who cares?’ swiftly followed by a more philosophical ‘why do we care?’ and finished off with a belt-busting ‘should we care?’ Why are we teasing the fact that he allegedly “snubbed ten McDonalds” in favour of a Byron Burger (who, in my opinion undermine the very concept of a burger by making it difficult to put in your mouth in one go)? You can be certain that had he chosen something from the famous Golden Arches he’d have been accused of encouraging Britain’s ‘obesity epidemic’. Is it because we are mocking the Chancellor’s apparent attempt to look like he is down to earth? In which case, are we really sure this was his intention, rather than just showing that he was working hard? Do we imagine that people who are labelled ‘posh’ never eat anything other than oysters and caviar, and if so what does this say about our own prejudices? I don’t think George Osborne has ever tried to deny his background. Yes, he changed his name from Gideon, but wouldn’t you? Yes he said “we’re all in this together” but this is a statement of fact, people across the board have been hit by the recession – not always via direct tax hikes and not always as much as we would like – but very few people have escaped completely un-wounded. In-keeping with the logic of the playground bully, who taunts the school rugby captain about his inability to swim, the media is attempting to humiliate him for something he is not, and should not feel, humiliated about. It certainly frustrates me, as a comprehensive-educated working-class northerner, that people like me are under-represented in the upper echelons of society and I think that Cameron has missed a trick by not making his cabinet more reflective of this concern. But I’m not going to begrudge George his burger and fries if he is the best man for the job. Nor do I care if he wants to drink champagne on a yacht, just as I don’t mind if George Galloway loves fine cigars. So perhaps we care because of the taxpayer’s burden of this ‘whopping £9.70’ meal? Well, we can argue until the cows come home about MPs expenses, but most private companies would allow an employee to spend up to £10 on a meal required during work. What you want to eat is your own business. Anybody who has stopped at a service station during a long drive between meetings can tell you that a tenner doesn’t go far. Even the trusty late night kebab and chips (not forgetting lashings of free chilli sauce) racks up the coins these days, whilst you’ll struggle to find an oil-sodden pizza for under six quid. In the circumstance, I don’t think many people within London would consider a £6.95 burger to be extortionate or uncommon. One of the issues is that I fear far too many people think being a politician doesn’t count as a proper job and shouldn’t require such expenses. I guess they think the Chancellor and his colleagues don’t work hard enough to deserve it, despite still sitting in their offices beyond 10pm when a civil servant would be calculating his or her overtime. Why do they think this when most of the population has no direct experience of an MP’s working life? Those who have worked alongside MPs and have seen them toiling in what is becoming an increasingly thankless task, wouldn’t begrudge Osborne his classic 6-ouncer. Could it be that they get this idea from the very same media that brings the offending piece of meat to our attention? 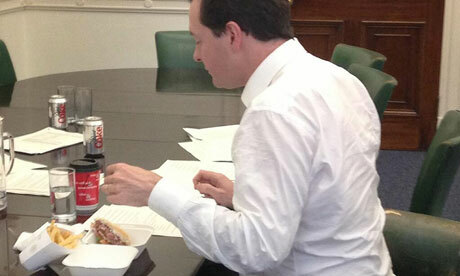 (The burger, not Osborne). The real scandal is not with what our Chancellor chooses to fill his stomach, but with what our newspapers choose to fill their pages. Whilst people risk their lives fighting for freedom in the Middle East and one of history’s major whistleblowers runs around the world seeking a safe haven after exposing state surveillance, we use our liberty to bring attention to a half-eaten breadbun perched on a piece of polystyrene. Is it any wonder that people are turned off by our dumbed-down politics and can’t be bothered to walk to their nearest polling booths when all we can tell them about those running the country is their favourite late night snack? 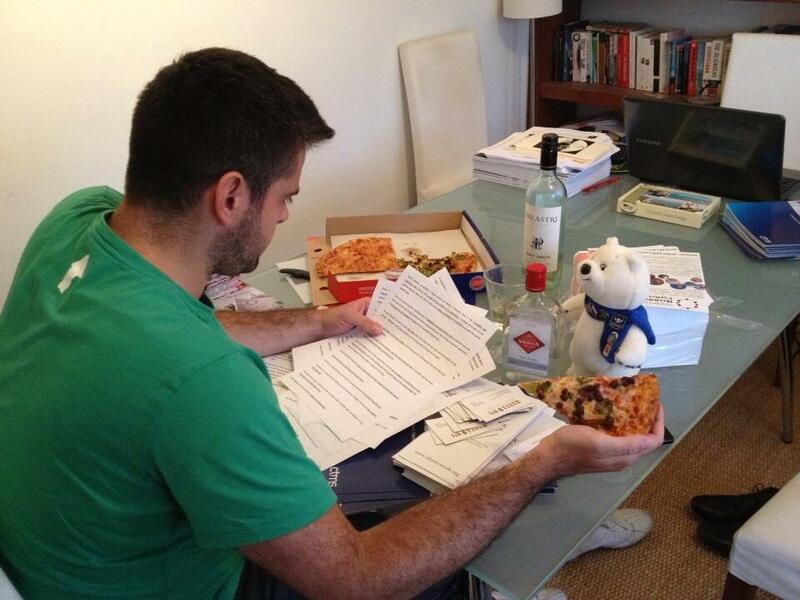 For what it’s worth, the best response came from Osborne’s food-loving colleague Eric Pickles, who tweeted a photo of himself working hard whilst eating salad, a sight once considered unlikely enough for Ladbrokes to offer odds of 3/1 on him being pictured doing so at the last Party conference. In one move he was able to show his contempt for the media circus surrounding the issue whilst also proving down-to-earth enough to laugh at himself. Of course Osborne tried to do the same on breakfast TV the next morning, but it seems that some people can never win! The Foreign and Commonwealth Office is one of the great Offices of State, once presided over by great historical figures like Balfour, Eden and Bevin, responsible for a £1.5bn budget, employing over 14,000 people across the World, and housed in one of the most impressive Italianate buildings on Whitehall. Engaging with it can be daunting. But like all government departments it struggles with internal and external pressures, funding shortages, and the lack of hours in the day. Contrary to what is often reported in the media, public affairs professionals (“lobbyists” if you want to use the dirty word) are vital to the provision of information required for effective decision making and for alerting ministers to oversights and errors. By their nature many politicians are forced to be a jack of all trades and can often rely on the public affairs community to fill in the gaps and express what those outside the Westminster bubble are thinking. One of the most frustrating things for anybody in Public Affairs is spending years cultivating relationships with particular Secretaries of State and Ministers, only to have to start again when they get reshuffled elsewhere and a new face comes in. Thankfully, with the respected William Hague at the helm, the Foreign Office has remained relatively stable compared to other departments, with both David Lidington and Alastair Burt working alongside him since the 2010 election. There have been some changes, with Hugo Swire moving from the Northern Ireland Office, Mark Simmonds joining Burt as a fellow Parliamentary Under-Secretary, and Baroness Warsi shoehorned in as the Minister for the fluffier side of Foreign Policy. Nevertheless, the problems of the never-ending ministerial merry-go-round reinforce the importance of devoting time to the more static civil service. 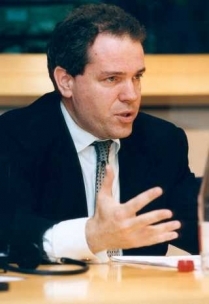 The Permanent Secretary at the FCO is Sir Simon Fraser, an experienced career diplomat who presides over a Management Board and several sub-committees as well as a host of experienced and knowledgeable civil servants that concentrate on specific issues and are usually grateful for updates and information from the outside world. Of course the problem with Foreign Affairs is that everybody has an opinion on them. They gain a great deal of media coverage and there’s never a shortage of protesters challenging the department, most of whom fail to get their point across effectively and are often considered to be nothing more than a nuisance. It is vital that those who want to make a genuine difference don’t fall into that trap. Central to productive public affairs is knowing how best to play the cards you’ve been given, but unlike poker the best result is when there is more than one winner. Taking into consideration what the department’s current aims are and assessing how your interests can fit within them is essential. With all departments under increasing budget pressures, the easier you can make their lives, the better. Often they are genuinely grateful for the provision of good research (particularly if it is independent) and accurate information. But it is also important to be realistic about what can be achieved. Unfortunately, you’re never going to stop a war (nor start one, hopefully), but aims below this threshold still need to appear to be in line with general policy direction and in an ideal world also save money. David Miliband attempted to pull together the department’s strategic objectives in the last Parliament and much of it remains the same, but in the fast paced world of foreign affairs, and given the ever-present risk of terrorism and the change of government, priorities can shift so it is important to keep an eye on policy announcements for an indication of direction. One of the most important things in any campaign is motivating third party advocates – those who are independent but support the same goals, although not necessarily for the same reasons. There is an obvious reason why a lobbyist argues the case that he or she does, usually because they’re paid to do so. But if others can be encouraged to argue the case too, not only can energies be diverted elsewhere but additional credibility is lent to the campaign. Other MPs are an obvious starting point for this. The FCO is shadowed by the Foreign Affairs Select Committee which contains twenty MPs with experience and an interest in this policy area, and who scrutinise the department, run consultations and often offer advice. There are also Committees for the Department for International Development and the Ministry of Defence, which inevitably have some crossover. Then of course there are All Party Parliamentary Groups, which represent and promote particular areas of interest. Foreign Affairs is awash with them … not only is there one for most countries (not including Fiji), but there are APPGs dedicated to Conflict Issues; Global Security; Human Rights; International Relations; United Nations; and so on. Each of these contain MPs who can take up a cause with the Foreign Office directly. Of course politicians, whether they are the Foreign Secretary or a back bencher, are also motivated by winning their next election, so voters are great potential third party advocates. 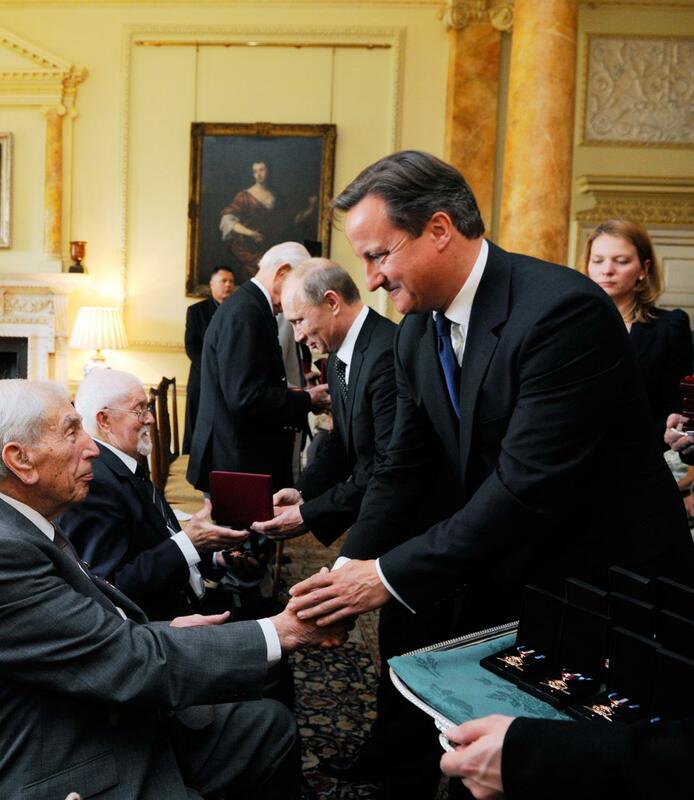 When Westminster Russia Forum was campaigning for the British World War Two Arctic Veterans to receive the medal they rightly deserved, we first identified which constituencies surviving Veterans lived within, and then wrote to their MPs suggesting that they take up the cause on behalf of their constituent. This makes the case far more powerful and also gets the attention of local media, who love a good story and visual about a local campaigning against the Government. We also organised a letter signed by supportive MPs to be sent to the Foreign Secretary, an act which gained national media coverage and cranked up the pressure on the decision makers. The Foreign and Commonwealth Office, gigantic and daunting as it is, is still motivated by many of the same problems as other departments – trying to balance the budget, remaining abreast of an overwhelming number of issues, and its political masters trying to keep enough people happy to remain in their job. If you can help them to resolve some or all of these problems, you’ll get off on the right foot. Last week (17/2/13) we saw an apparently landmark ruling, as a scarf-clad student stood outside the courts declared that young people would no longer be forced into slave labour by the evil right-wing Government. Unusual in the circumstances, I couldn’t help but feel a pang of pride when I heard the decision, having been following the full story for a while. Not because the young student, Cait Reilly, had won a victory over a particular scheme, nor because I hate pound shops – but because Miss Reilly had been forced to give up a voluntary role that she enjoyed and found useful in pursuit of a blunt instrument policy that led her down a meaningless dead end. It reminded me of an experience I had a few years ago. In 2009, I was one of several to be hit by a second wave of redundancies at a PR firm which had experienced the highs and was now experiencing the lows of specialising in lobbying on planning applications. Like many people who lose their job, I experienced an inner wave of self reflection, beating myself up over things I might have done differently to save my own skin, and questioning my own abilities. The decision hadn’t come out of the blue, and I’d been relatively active in the job market for a good period beforehand. But, of course, filling out endless applications after work grinds you down, and upon the receipt of several rejection letters (if they can be bothered to acknowledge you!) it is easy to wonder why you bothered. I’d been thinking for some time that I’d like to do something more worthwhile and fulfilling in my life, having had enough of being shouted at by people who didn’t want a giant supermarket built in their back garden, but I never seemed to have the time. Then, suddenly, redundancy granted it to me. I went online and found a volunteering website where I submitted my details and some preposterous, out-of-date and extensively duplicated search results popped up. And so I opted for a more face-to-face approach and headed down to the local voluntary centre. I had free time on my hands for as long as it took to find myself another job, and I wanted to offer my services voluntarily to whoever could benefit from them, I said. The old ladies in the centre were perplexed. Clearly this sort of thing didn’t happen often. They gave me a lop-sided form which looked like it had been photocopied using soot, asked me to fill out my details and skills and said they’d try to match me to an opportunity. But I needed to hurry because they were closing for the day shortly (it was lunch time). Saying what skills I had wasn’t easy. I’d been what anyone outside the Westminster bubble would term a ‘career politician’, jumping from university to parliamentary researcher to election organiser to lobbyist. What could I offer a local charity that they couldn’t get from anyone else? As much as I’m a big supporter of Guide Dogs, the thought of taking one out for a walk filled me with horror… since I was a kid, dogs have tended to be way too keen to test how tasty my legs are. Yes, I could stand behind a counter in a charity shop and had done so as a teenager, but was writing prices with a blunt pencil on the inside cover of an old Mills & Boon novel a waste of whatever talent I had? Thankfully there was a box for ‘Media and Publicity’ which I ticked before returning the form. It is fair to say that, on the whole, charities are awful at encouraging people to volunteer for them. National giants that are run more like corporate bodies aside, most don’t even know where to start to attract anybody that isn’t already connected by personal circumstance. Websites are usually out of date and littered with broken links, emails bounce back, phones go straight to clunky answer machines. But who can blame them? For decades they’ve been getting by as best they can, often pushing their volunteers to the limit and relying on an occasional grant from a local mayor. And when people do offer their services, they don’t know what to do with them. Websites and centres designed to link volunteers with opportunities tend to be problematic too. If I’ve seen the advert offering me the opportunity to do the accounts for the local nursing home once, I’ve seen it twenty times repeated in the same search. All posted three years ago. Surely if the Government can run other more complex initiatives (please debate this another day), they can arrange for someone to set up some decent straight forward scheme to support such organisations and assist people like me? Having submitted my forms, I heard nothing for weeks. In the meantime I’d written to all the charities I was a member of offering my time. One large mental health charity which I’d supported for a long time didn’t even reply – an extremely sad omen given the number of unemployed people who either suffer with or develop mental health issues. Eventually I received a few pages listing four charities in the area that might need my skill set. I contacted all of them, but only one responded – a regional Autistic Society. So I found myself sat in the ‘office’ of this charity trying to explain to three confused ladies about how I might help them and why. It seemed they were deeply suspicious of me, probably wondering if I was just going to steal their donation tin and run. But, thankfully, they gave me a chance, and I gave them whatever time I had spare between the usual job hunting. Over the next month or so, I helped to give them a new lease of life. I wrote and designed new eye-catching leaflets and posters; rejuvenated their dingy website; organised events at a nearby autistic school; got the local newspapers along to cover their work; publicised a sell-out barn dance fundraiser (no, I didn’t have to dress up as a cowboy); and won them a £1,000 grant. Not only were they delighted but I had new faith in myself. It reminded me that I did have skills and experiences that were very valuable to others. Writing a press release was second nature to me, but clearly wasn’t to the retired gentleman who happened to have some vague publicity role on their committee. Marketing techniques I’d learnt elsewhere and the ability to actualise them on a computer screen was lost on the ladies who were still doing everything by Pritt Stick and fax. Then came the stunning bit. On my fortnightly visit to the job centre, as the advisor tapped away on his keyboard, ignoring my list of job applications he was meant to be checking, I mentioned to him that I’d also be doing volunteer work. He stopped tapping and glanced up. “You can’t do that”. Oh? Why not? I was told that if I continued to do this amount of volunteering, my Jobseeker’s Allowance would be removed. “I could just lie to you,” I said. I received a glare and for once I shut my mouth and left with my form signed. Ay, there’s the rub! Surely we have everything entirely upside down? What nonsensical society can we be living in where not only are some people not incentivised to work, but they’re even punished for working for a good cause for free? Surely, if the ‘Big Society’ is worthy of its name, we should be encouraging and indeed rewarding people not only for showing initiative but for giving their time to benefit others. In a period when funding is being withdrawn from lots of charities and long-term volunteers are increasingly pushed for their own time, surely this is when we want bright talented individuals to step forward and pick up the slack. It is in their interests as much as everyone else’s. And this is what was wrong with the situation Cait Reilly found herself in. She had been intelligent and resourceful, finding voluntary work in something relevant to her skills, experience and ambitions. Yet the Government treated it with contempt. Giving your time to the local dog pound is considered less worthy than giving it to the local pound shop. Charity books aren’t as important as tins of beans when it comes to replenishing shelves, apparently. But as the judges in the case made clear, there was nothing inherently wrong with forcing people to work for free, per se. Then why aren’t we sending them in the direction of voluntary organisations instead of national companies? So here’s a bold idea, Mr Duncan Smith: why not help charities to find these people and make use of them? Why not get Job Centre advisors to tell them what their volunteering options are? Why not … heaven forbid I’m accused of espousing people ‘earning’ their benefits … make a percentage (say 20%?) of the Job Seekers Allowance dependant on doing one day’s charity work a week? Let’s see how the country changes when 2.4 million people offer a combined 57 million hours a week to the perplexed old ladies at the voluntary centre! And to conclude, when I was finally successful and received a job offer, the fact that I’d “got on my bike”(as someone once said) to find myself opportunities and kept myself busy was a major factor in me being chosen ahead of other candidates. The benefits of such an approach are wide-ranging.